Spanish lawmakers on Thursday approved a decree by the Socialist government authorising the exhumation of late dictator Francisco Franco from a vast mausoleum near Madrid. The sensitive decision to move Franco’s remains from the monument was approved by a vote of 172 in favour and two against. There were 164 abstained votes, from the centrist Ciudadanos (Cs) party and the conservative People’s Party (PP). 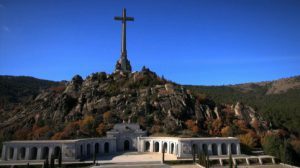 Socialist Prime Minister Pedro Sánchez, who came to power in June after toppling his conservative predecessor amid a graft scandal, has made removing Franco’s remains from the grandiose monument in the Valle de los Caidos (Valley of the Fallen) one of his priorities. ‘Justice. Memory. Dignity. Today Spain takes a historic step … today our democracy has become better,’ Sanchez wrote on Twitter. General Franco, who ruled Spain with an iron fist from the end of the 1936-39 civil war until his death in 1975, is buried in an imposing basilica carved into a mountain-face just 50 km (30 miles) outside of Madrid. Built by Franco’s regime between 1940 and 1959 – in part by the forced labour of political prisoners – the monument holds the remains of around 37,000 dead from both sides of the civil war, which was triggered by Franco’s rebellion against an elected Republican government. Franco, whose Nationalist forces defeated the Republicans in the war, dedicated the site to ‘all the fallen’ of the conflict in an attempt at reconciliation, but only two graves are marked – those of Franco and Jose Antonio Primo de Rivera, the founder of the far-right Falangist party which supported Franco. But victims’ relatives and activists have campaigned against it because forced labour was used in its construction and because it keeps Franco’s tomb in a prominent location, near the basilica’s altar. The site was long used as a place to pay tribute to Franco on the anniversary of his death, but that was stopped by a 2007 law. Valley of the Fallen, viewed from the esplanade. Many on the left are repulsed by its existence, comparing it to a monument glorifying Hitler. Others, often on the right, insist the Valley of the Fallen is just a piece of history whose critics have twisted its true meaning. In parliament on Thursday, Deputy Prime Minister Carmen Calvo called for the end of the ‘extraordinary anomaly’ of having a former dictator ‘exalted’ in a state mausoleum. ‘There will be no respect, no honour, no harmony as long as Franco’s remains are in the same place as his victims,’ Calvo said. She recalled that parliament had already approved last year a non-binding motion calling for Franco’s remains to be removed from the mausoleum but the motion was ignored by the former conservative government of Mariano Rajoy. Rajoy’s government condemned Francoism but had blocked previous attempts to exhume the dictator’s bones. The Socialist government has indicated the body would be exhumed by the end of the year. Franco’s family has fiercely opposed the decision, which has divided Spain and opened old wounds. The family has said it would if necessary ‘take care’ of Franco´s remains which was taken to mean they will take them to a family vault in Madrid. According to deputy PM Calvo, if the family refuses to transfer his remains there, the government will pick a spot to rebury him. The Francisco Franco Foundation, which receives state funding despite some calls to end it, has pledged to legally fight any moves to exhume Franco’s remains.